With our patent-pending BeFree Fence Posts, Royal Aluminum has taken the sting out of your family having fun around the pool. Traditional fence systems feature gaps where the rail meets the fence post, creating a favorite spot for bees and other stinging insects to build their nests. Royal�s unique manufacturing process brings the rails tighter into the posts, virtually eliminating these gaps. Royal's innovative BeFree design also improves the strength of our fencing system, so you can enjoy years of maintenance-free, esthetically-pleasing fencing that will add value to your property. All pools should be fenced, but the weakest link in the fence is the gate and it should be alarmed. 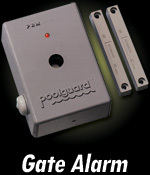 Any gate which allows young children easy access to a pool area should have a gate alarm. 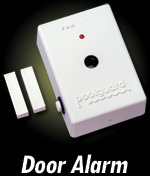 The majority of children that drown in pools go out the back door first and Poolguard's Door Alarm can help protect those doors.